A 20-foot menorah made from party balloons was a model of buoyant architecture Sunday, standing tall, then horizontal, then tall once again in the ocean breeze. 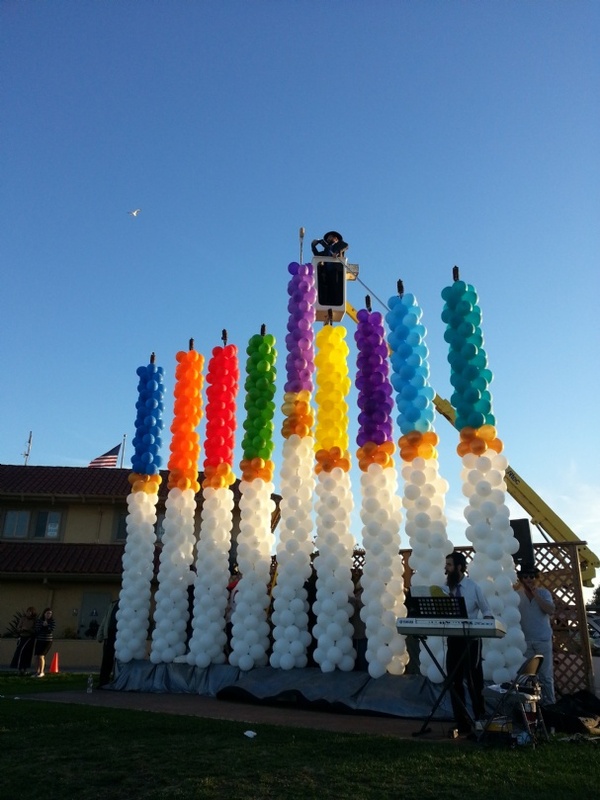 In fact, the Hanukkah balloon candelabrum in Ventura Harbor Village may be the largest ever made, said Rabbi Dov Muchnik, his eyes lit with enthusiasm and not a small amount of humor. Sunday’s celebration, hosted by the Chabad Jewish Centers of Oxnard, Ventura and Camarillo, marked the fifth day of Hanukkah and drew more than 200 people. The event featured food fried in oil, such as potato pancakes and doughnuts, commemorating the symbolic oil that burned for eight days when a small band of ancient Jews took back the Temple from Syrian-Greeks. Muchnik; Rabbi Aryeh Lang, director of the Chabad Jewish Center of Camarillo; and Rabbi Yakov Latowicz with the Chabad Jewish Center of Ventura; have worked on celebrating Hanukkah publicly and inclusively for the past 10 years. One celebration featured a menorah sculpted from ice. Last year, they sent Sheriff Geoff Dean up in a cherry picker to light a more stable 20-foot menorah. Their goals are to draw crowds and spread the message of Hanukkah: Bring light in dark times; bring joy to others; a good deed can transform a life. The holiday usually falls in December but this year coincided with Thanksgiving. The last time that happened was in 1888. Latowicz said the rare occurrence put a spotlight on this year’s Hanukkah celebration as a celebration of religious freedom. Thanksgiving is a national holiday tied to the escape of Pilgrims from England to practice their religion as they saw fit; Hanukkah commemorates a military victory over Greek invaders and the rededication of the Second Temple in ancient Jerusalem. “Both are holidays that say: Thank God I am free,” Latowicz said. Susan Feliciano and her husband, Enrique Lucero, brought their two daughters to the Hanukkah festival. The couple, who are not Jewish, want their daughters to learn about the diversity of religion and culture in the community. One of the best ways to learn is through holidays, Feliciano said. Chabad is a worldwide Jewish outreach organization that sponsors thousands of public menorah lightings across the country, from the White House to malls and parks. In Ventura County, more public celebrations are planned for the remaining days of the Jewish holiday, which ends Thursday evening, including a Lego menorah built during a celebration Wednesday in Camarillo’s Constitution Park. “We hired a Lego company to come and build it,” Lang said. Sunday was Lang’s birthday, and as a prize he was designated the lighter of the balloon menorah. Before ascending in a cherry picker, he watched as the balloon branches began to float forward to meet the ground, pinning a disc jockey and his keyboard in a cushioned embrace. Eight men from the crowd volunteered to hold the wobbling candlesticks steady as Lang, undeterred, went aloft with a flame for a successful lighting. Mendel Lang watches his father, Rabbi Aryeh Lang, light a menorah made of 1500 balloons Sunday at the Grand Chanukah Festival at Ventura Harbor in Ventura. Rochel Leah holds the hand of Rabbi Yakov Latowicz, her grandfather, as they dance beneath a menorah made of 1500 balloons Sunday at the Grand Chanukah Festival at Ventura Harbor in Ventura. The chabads of Oxnard, Camarillo and Ventura hosted the celebration. Children with the Conejo Jewish Day School choir prepare to perform Sunday at the Grand Chanukah Festival at Ventura Harbor in Ventura. Wind topples the menorah made of 1500 balloons Sunday at the Grand Chanukah Festival at Ventura Harbor in Ventura. No one was hurt. Casey McComb dances with fire Sunday at the Grand Chanukah Festival at Ventura Harbor in Ventura.